Wow, did you know talent abounds in the blogosphere? Of course you do. Also, in case you were wondering Jenny already did a post on the above dot fabrics here. Secondly, did somebody really just hand cut a stencil and then paint their wall to look like the below..
Why yes they did and her name is Danika and she shares the step by step process here. I absolutely love tat abstract tiger lamp. Bananas! Where do I begin!? Your blog is fabulous!! The images are always fresh & stunning - you have an incredible eye for color. Everything you post is always inspiring. Keep up the awesome work! seriously that wall is from a hand cut stencil???? that is brilliant!! WOW! Those chairs are gorgeous. 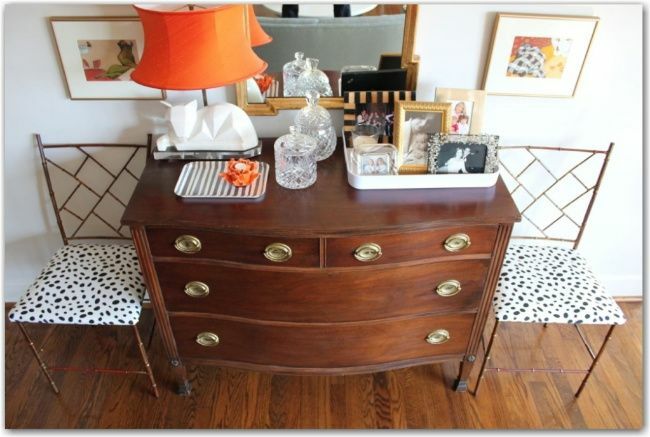 I used the same Premier Prints fabric on a pair of ottomans--the fabric is just wonderful! Now I have a new blog to check out! Loving the orange shade and that lamp and the blue light hanging. Wow and that wall, amazing! Two very talented people- those chairs and the orange wall are BEAU-ti-FUL! Lots of talent out there indeed. 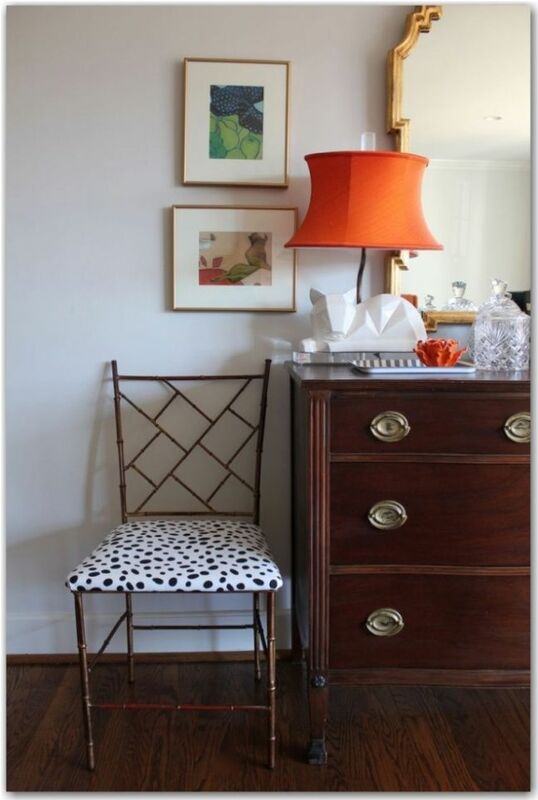 Love the spotted chairs with the orange shade on the lamp. 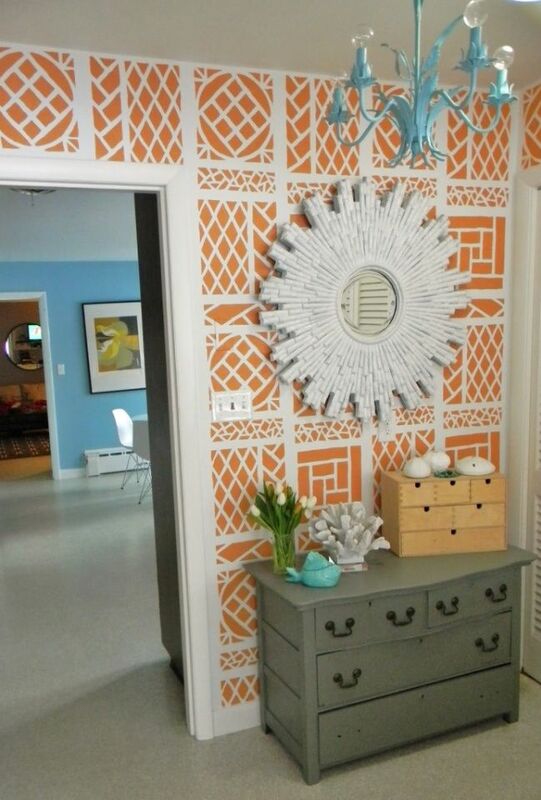 And that stencilled wall is amazing!! It's amazing how that black and white dot can look so sophisticated!!! Well, this is a surprise! Thank you, Christina, for the mention and such generous words. :) You are allllll riiiiight! Oh, my that stencil is the burrito supreme! Gorgeous. Love those chairs. Also love the tray for pictures. I may be a tray-aholic!! !